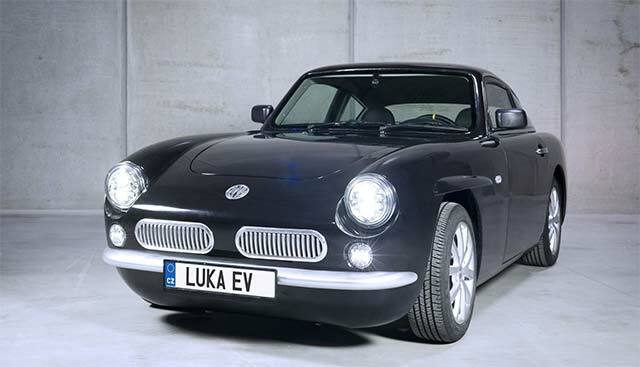 MW Motors, a Czech car company start-up, has unveiled a stylish retro-looking Luka electric vehicle. The two-seat Luka EV uses four 12.5-kW in-wheel electric motors, delivering a combined power of 50 kW (66 horsepower). That’ll push the car from standstill to 62 mph (0-100 km/h) in 9.6 seconds. Top speed is 691 mph or about 145 km/h. The Luka EV has an aluminum alloy chassis with fiber-reinforced plastic body and only weighs a little less than 1,800 pounds (815 kg). It uses a 21.9-kWh Li-ion battery pack that will provide a range of 186 miles (300 km) on a single charge. And the company says it can charge to 80% capacity within one hour, but doesn’t say which specification of charger is required for such performance. MW says development is ongoing so figures may differ once production starts. The company is in the process of having the car independently certified and crash tested and will reveal further details as development continues.